For a real Vermont Country Inn experience a visit to the Buckmaster Inn is just perfect. 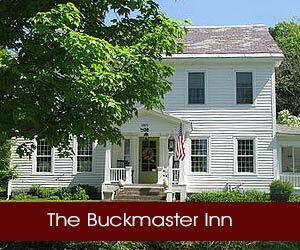 Buckmaster Inn offers weekend or midweek getaways – an ideal Vermont inn vacation experience. This Green Mountain country inn is tucked in the hills, but just a short drive to Vermont’s most popular Ski Resorts – Killington and Okemo. The Buckmaster Inn was built in 1801 and is on the National Register of Historic Places. Of course the building has had extensive renovations but has retained a very nice vibe. Buckmaster Inn is a great place to relax. Yankee Magazine has been here and describes the rustic charm of this historic building as being decorated with soft colors and muted fabrics. An antique toy wagon sits next to the dining room fireplace filled with split wood. An old screen door covers the pantry and a garland of lights entwined on a fence in the upstairs hall is just a part of what Yankee Magazine describes as rustic country charm. A highly recommended historic Vermont Inn. Ask us about Killington, Okemo and Southern Vermont Inns. If you would like to feature your Southern Vermont Country Inn, Lodge or Bed Breakfast Inn to this web site, please contact us.